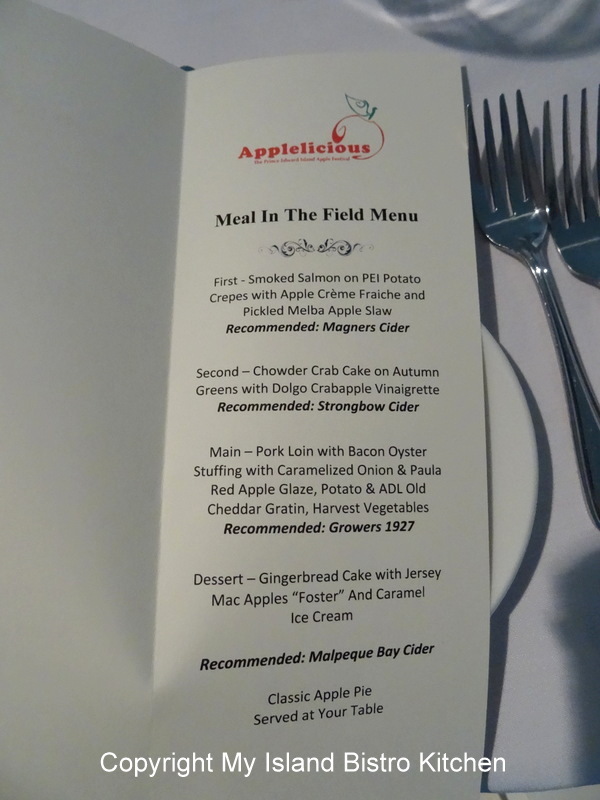 On Saturday, September 14th, I headed to Arlington, west of the City of Summerside, for another PEI Fall Flavors signature event – “Applelicious – Meal in the Field”. This is my second Fall Flavors event this year. 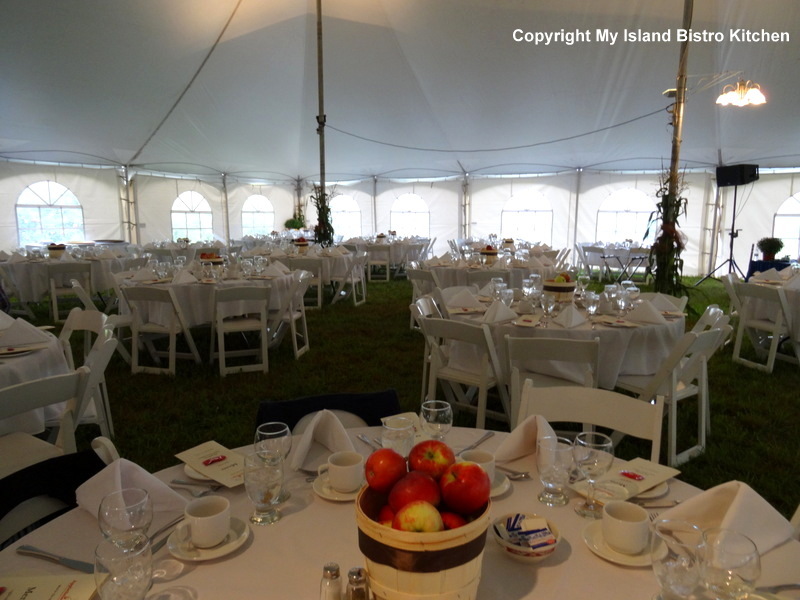 What better place to erect a huge white tent as the venue for a sumptuous dinner than in the middle of fragrant Arlington Orchard with trees laden with bright red apples. 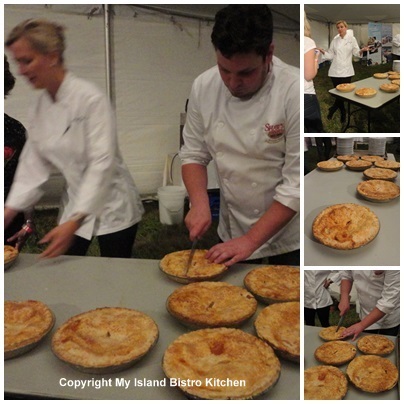 Fall Flavors is a month-long food extravaganza on PEI, with culinary events occurring at various venues across the Island. 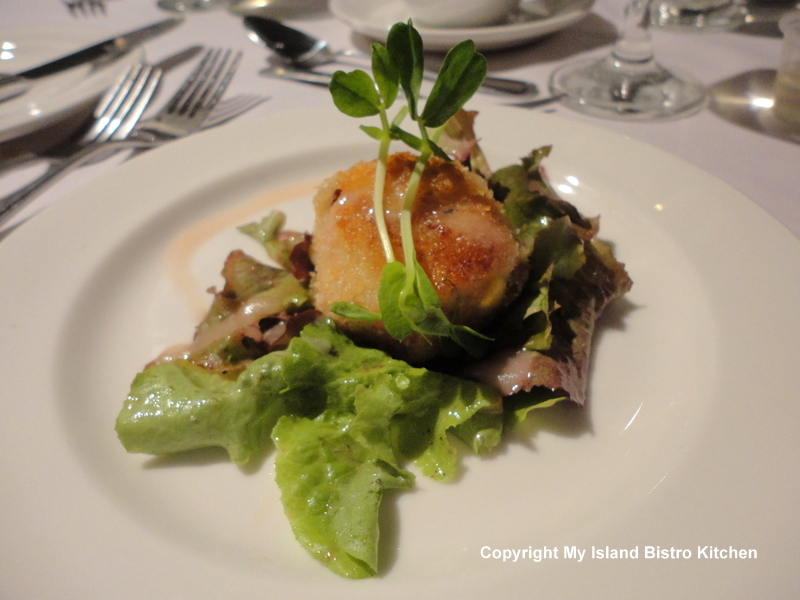 Each signature event features a local Island food product on the menu. This is the fourth year that Applelicious has been held and always in the Arlington Orchard location. Mitchell Rennie of the North Cape Coastal Drive Region says a number of factors were considered in selecting the facility for the event: “We needed a facility that was open to the idea of having large-scale events in their orchard and we wanted an area where we could get into the middle of an orchard for the atmosphere. These factors led us to Barry Balsom’s facility“. As its name suggests, this event focused heavily on PEI apples. 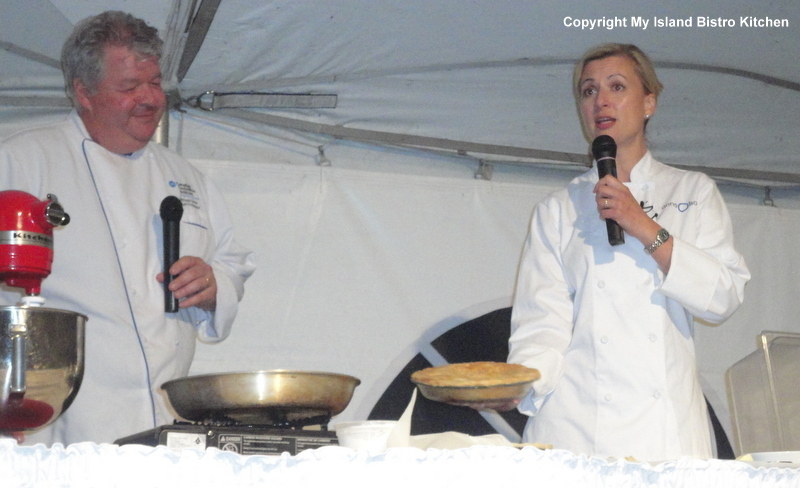 This being a signature event for the Fall Flavors Festival, it was hosted by a celebrity chef – in this case, Anna Olson. 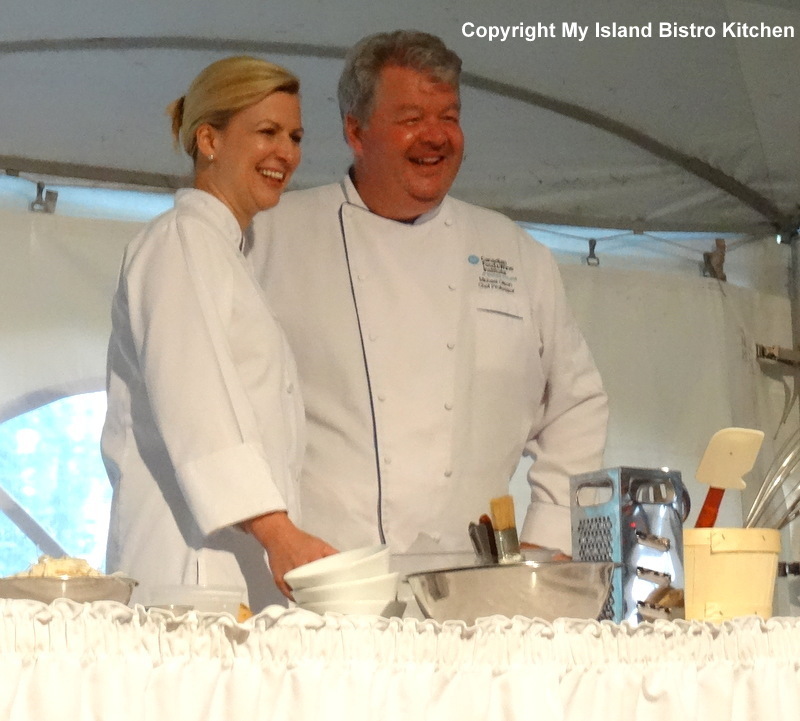 If you are a fan of Food Network Canada, you will likely have seen some or all of Anna’s shows that include “Sugar”, “Kitchen Equipped”, “Fresh with Anna Olson”, and “Bake with Anna Olson”. 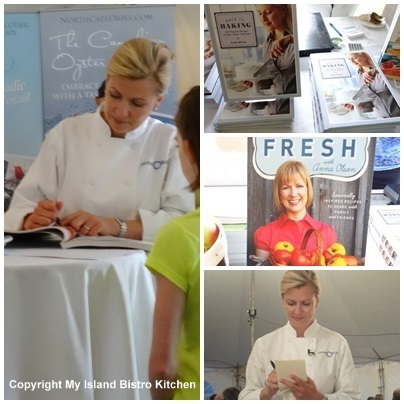 Author and co-author of several cookbooks, Anna is also a freelance writer for several publications as well. For this event, Anna also brought her husband, Michael, to the Applelicious event and the pair made fine hosts for the evening. 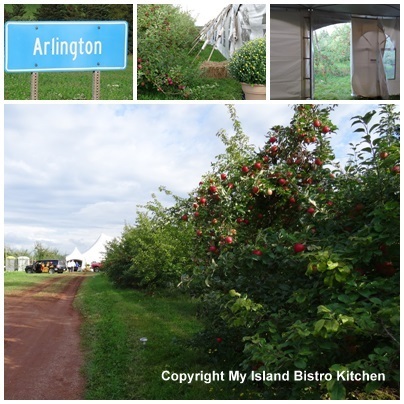 I have often picked apples at Arlington Orchards … yes bushels of them! However, I had never eaten a meal in the middle of an apple orchard so this event intrigued me. How could they produce a four-course meal in an orchard with no buildings, electricity, or running water! 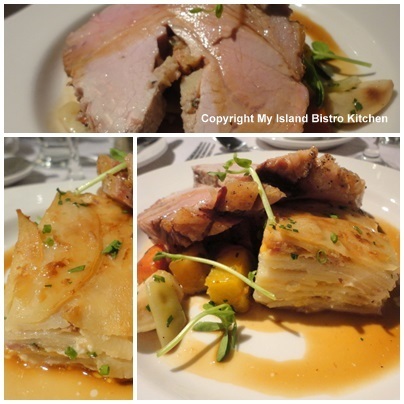 No worries as it is amazing what our Island culinary teams can do when put to the test. The evening started off with an oyster, apple cider, and cheese reception along with a meet and greet with Anna and Michael Olson. 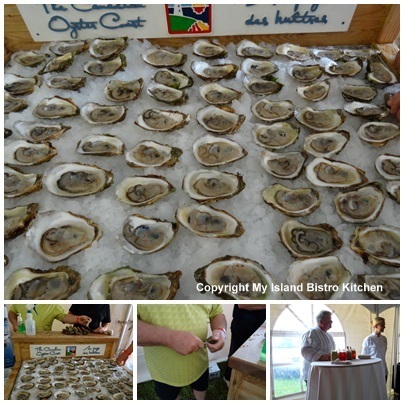 Of course, as many of you will know, our Island oysters are world renowned and are always popular. 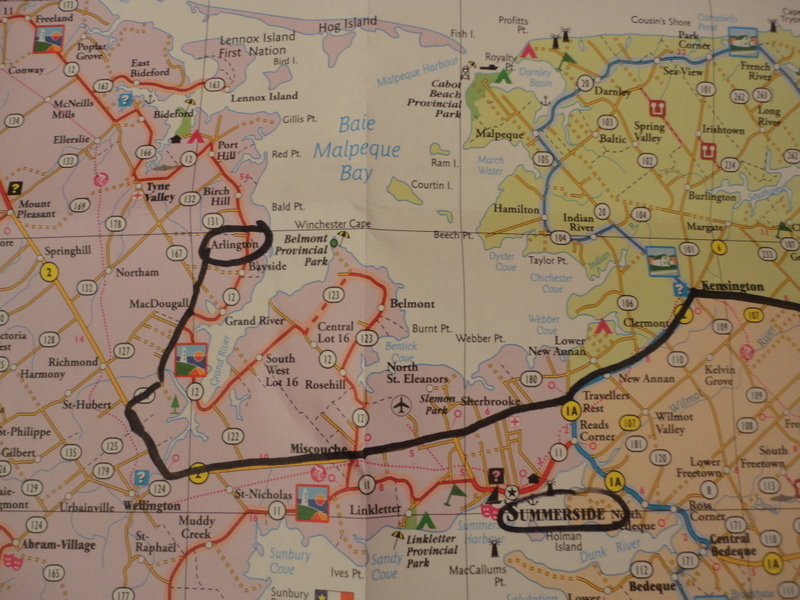 In keeping with the theme of local foods, the oysters came from the bays around Arlington. Anytime you see an oyster shucker in action, foodies are generally not far away, ready to sample these sea-fresh tasty morsels. To enhance the oysters, Anna created five different apple-themed toppings especially for the reception. 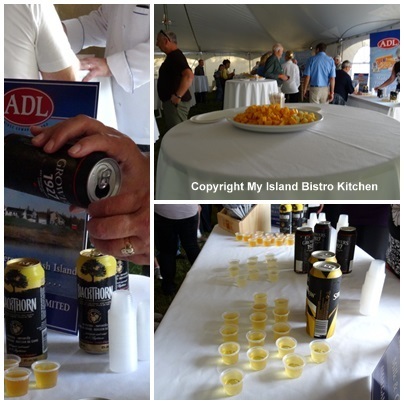 There were several kinds of apple cider to sample along with a selection of PEI Amalgamated Dairies Limited (ADL) cheeses. Anna was very obliging to pose for endless photos throughout the evening and to sign the menu cards that were at each place setting as well as her cookbooks that were for sale during the evening. I never cease to be amazed at the elegance that can be created inside a tent. 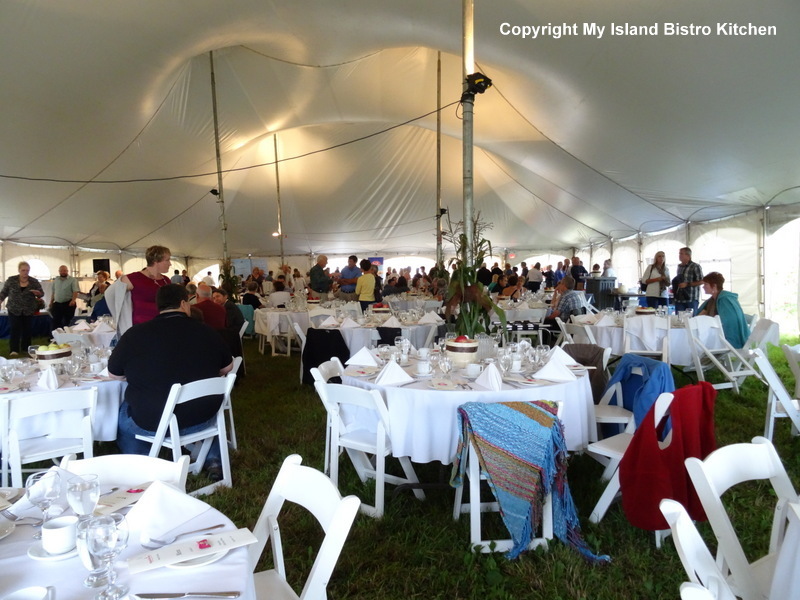 At one time, a meal in a tent meant paper plates, plastic cutlery and glasses, and picnic tables. 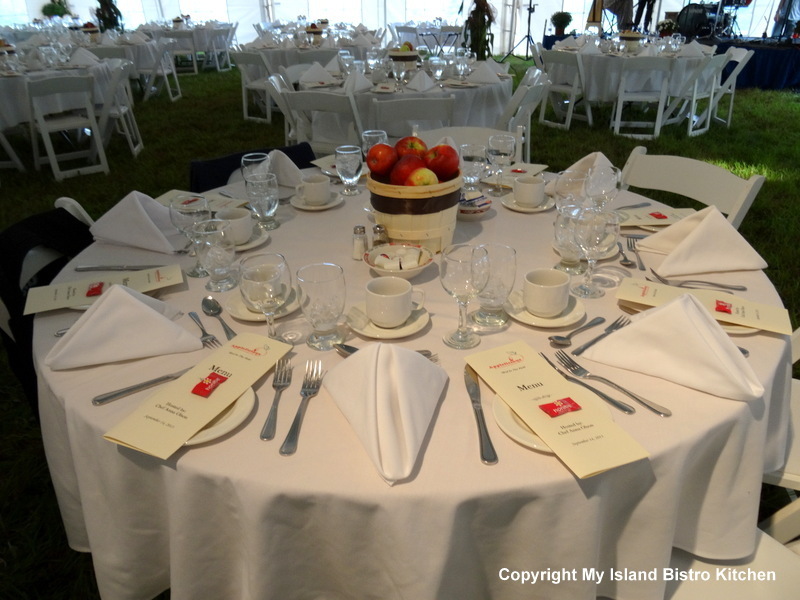 However, take a look at the white linens and fabulous tablesettings that greeted guests to Applelicious! 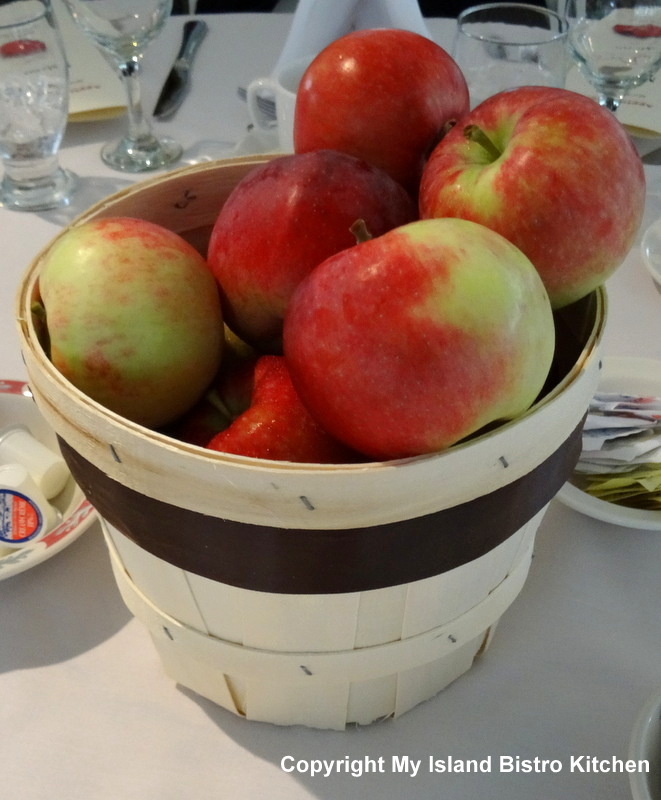 Look at the simplistic baskets of apples that were each table’s centerpiece. These were so appropriate for an event that featured apples. Nothing more was needed to adorn the table and, of course, the contents of the centerpieces were all edible, too. Part of culinary tourism, and a feature part of the signature events of Fall Flavors, is the educational component. Not only are culinary tourists seeking out great food and dining experiences, but they want to learn something about that food, where it came from, and how it can be prepared. 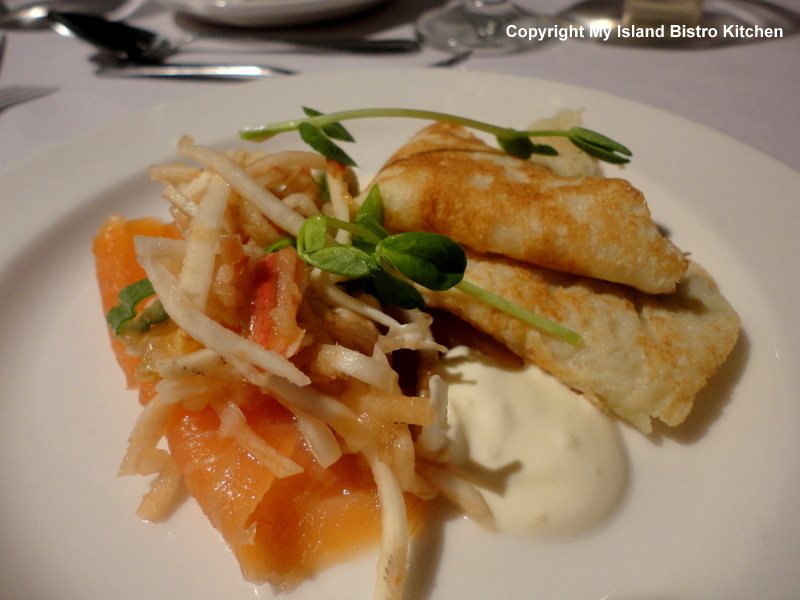 For this event, Anna and Michael started their first demonstration of the evening with how to prepare potato crepes (using fine PEI potatoes, of course) and pickled melba apple slaw (with apples from Arlington Orchard) which was very delicious. For the second demonstration, Anna showed how to make pastry and gave tips on how to make the perfect apple pie – did you know that the best apple pies are made with a combination of different varieties of apples? That sprinkling some rolled oats over the bottom pie crust before adding the apple filling will help to keep the lower crust from becoming soggy with the juices from the apples as the pie bakes? 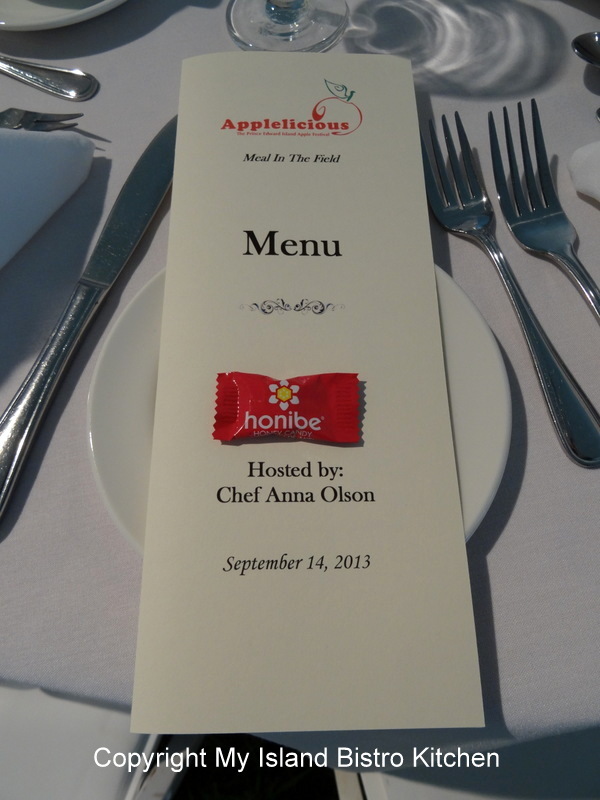 Part of Anna’s role in the evening was to plan the menu and provide the recipes. As you can imagine, dinner for 185 guests (many of them tourists) – particularly in the middle of an apple orchard – takes a team effort. 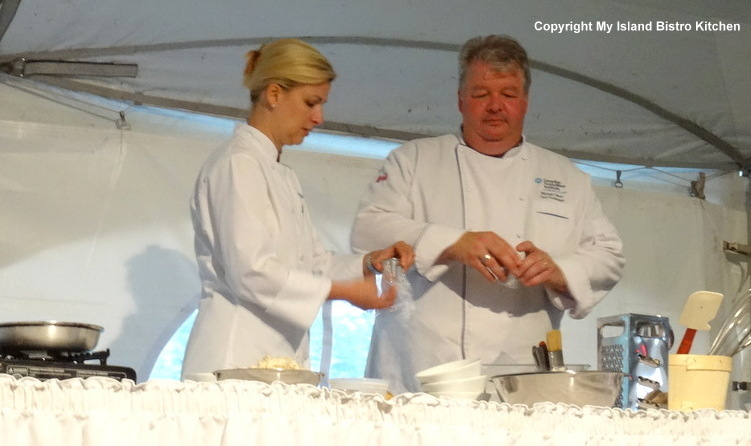 For this, the culinary team of Shaws Hotel and Restaurant in Brackley Beach, PEI, provided the culinary/catering services for the evening, taking Anna’s recipes and preparing them for guests all, of course, under the guidance of Anna. 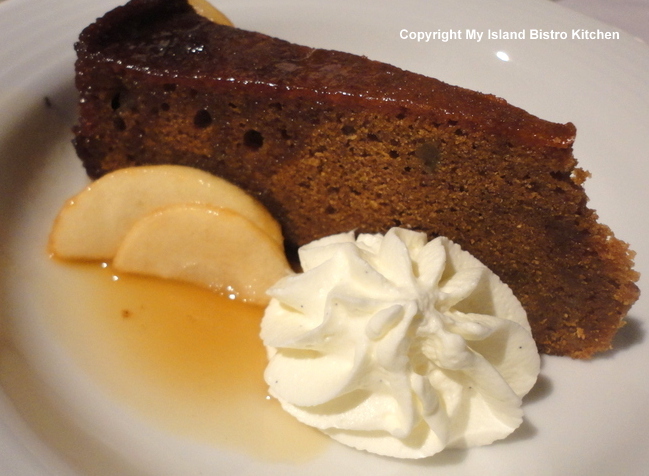 Anna indicated during the evening that PEI grows varieties of apples that weren’t familiar to her so she had consulted, in advance, with orchard owner, Barry Balsom, and researched the Island varieties when preparing the recipes so that Island apples would be featured in the menu items. During the evening, both Anna and Michael circulated amongst the tables, stopping to chat with guests and sign menu cards. 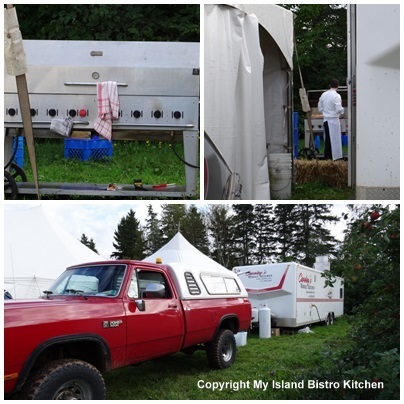 While much of the prep work for the meal with done off-site, one mobile kitchen was brought onsite and all plating and final cooking occurred in the catering section of the tent or just outside. Generators, of course, were needed to supply the electricity. 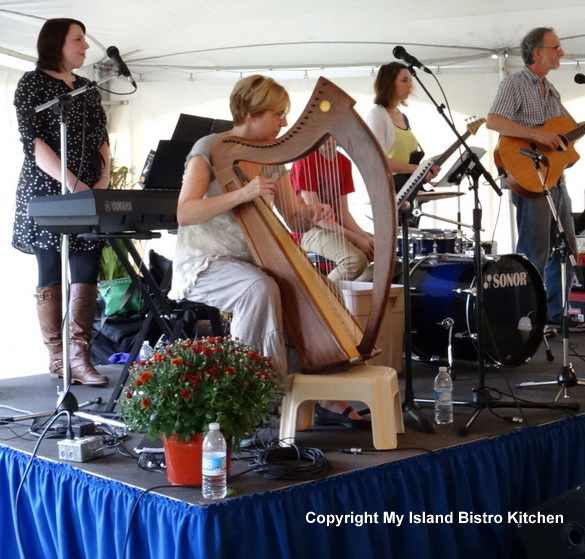 Two musical groups provided the entertainment during the evening – the Gallant Family Band (seen in the photo below) and the quartet “Milk and Honey”. 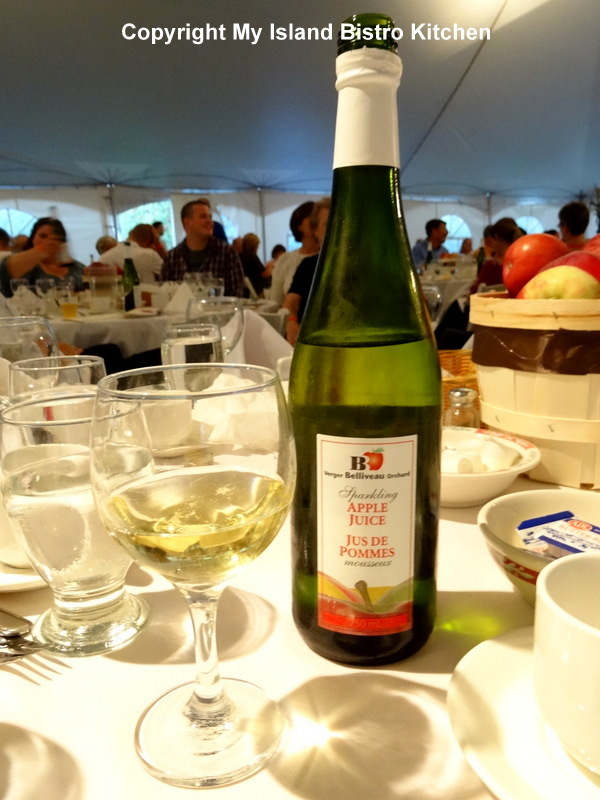 Beverages: Bottles of Maritime-produced Sparkling Apple Juice were placed on each table. Tickets for this event were $69.95 + tax (CDN$). I am often asked what is the best month to visit PEI. Admittedly, I am biased since, being a native Islander, I think anytime is good to visit our fine province. However, if you are a foodie then, hands-down, my recommendation would be to visit us in September when the whole month is filled with fabulous culinary events across the province. 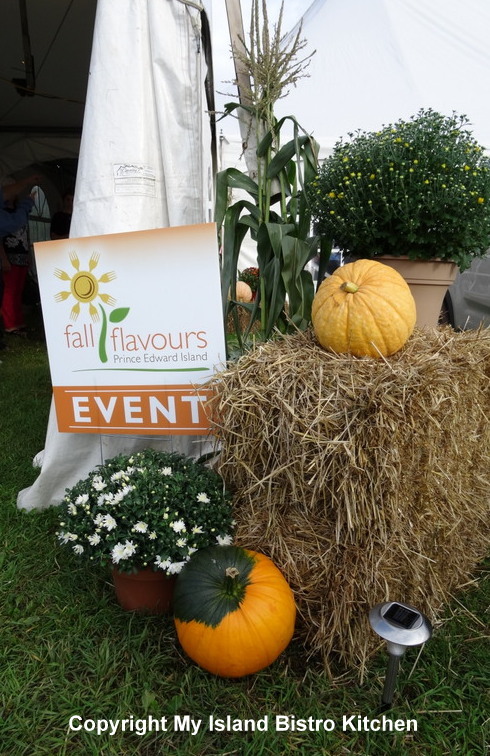 Whether you are an Islander, or planning a trip to PEI in September, I highly recommend you check the Fall Flavors website for event and ticket information to any of a number of great culinary events. Be sure to book your tickets early as the signature events usually sell out.